On a Monday afternoon, about 10 students gathered in Mr. Despres’ English classroom for a meeting of the Literary Club. Co-leaders, Amina Mednicoff-Misra and Anu Sitaraman came prepared with snacks and materials for their activities. The crisp smell of citrus filled the air from a bag of clementines sitting on a desk; freshly baked lemon bars were presented on a plate, next to the fruit. Everyone sat in a circle around four desks being used as a table to house the snacks. First, the students went around and introduced themselves. Next they described how their day was going. Mednicoff-Misra and Sitaraman had prepared a “blackout poetry exercise” to do from their current book, All The Light We Cannot See, by Anthony Doerr. Copies of a page were passed out, along with markers; students colored over some text, creating poems with the words they chose to leave visible on the page. Even those who had not read any of the book participated based off of the one page they were given. Mr. Despres described it as a “lively and dynamic” group of students. These are shocking statistics that have changed drastically over the past few years. 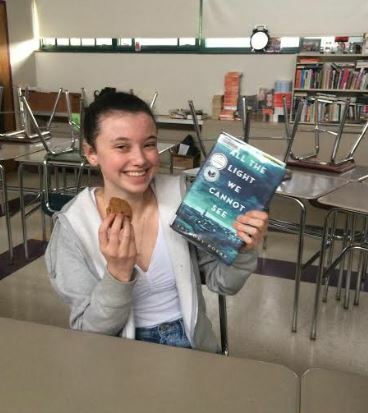 The literary club provides an outlet for the few book lovers left to come together after school and share their passion. Sitaraman had the initial idea of the club, then came to Mednicoff-Misra. Sitaraman knew Mednicoff-Misra had been to many writing workshops and camps so she had a good idea of how they were run. Sitaraman started the club because there was no book club or writing club and she wanted the opportunity for people to have a more casual place to read and engage in writing workshops. She and Mednicoff-Misra decided to share the responsibility completely, as co-leaders. In the beginning, the club was “all over the place” because they were still figuring things out. Mednicoff-Misra said Mr. Despres is a very supportive advisor and everyone involved is consistently interested, making the club feel very grounded. Ella Stocker, the librarian, was tasked with finding good books that the school has enough copies of. Because the club is not school-sponsored (meaning there is not funding for an advisor), they can’t hold bake sales to raise money. However, they could potentially seek recognition as an official club in the future. Mednicoff-Misra loves reading because of the way “your attention can be distracted from daily struggles and all of your thoughts can be channeled into the world of the book.” Watching television shows or movies also give you a distraction, but it is a very different one. Books allow every person to imagine things in a different way. Descriptions can be interpreted in various ways so you are free to imagine anything you please. In contrast, the decisions are already made in television and there is less room for imagination. Growing up, Mednicoff-Misra was often read to. “After dinner my mom would read to me and my brother before watching tv and going to bed,” she said. She was always reading on her own as well, and her mom picked out different types of books that she wouldn’t have chosen on her own. She and her brother often read the same book and since they were such different people, they would pull different messages from their shared reading. The group’s most recent meeting had a great turnout of about 10 people including Mednicoff-Misra and Sitaraman. Many people had been involved with school theater productions and hadn’t been able to come to previous meetings. Now that some after school activities are over, more people are expected to come to the winter meetings. I asked Mednicoff-Misra why she puts so much time and effort into this club. She had baked cookies for the meeting herself and brought clementines, along with supplies for the activities. “I like people being happy, and people are happy with food,” she said. Over the summer, Mednicoff-Misra and Sitaraman put in some time to put together a proposal for the club’s meeting; Mednicoff-Misra said it was “easy doing it with a friend” because they both enjoy reading and writing. The club’s advisor, Mr. Despres, first met Mednicoff-Misra and Sitaraman when they were in his sophomore class last year and approached him about their idea for the group. He knew they were serious about writing, reading and literature and understood the importance of students being able to get together outside of class. He also believes every school should have a literary club. It was decided that it was too late in the year to start a club and that they would talk more the next year. Over the summer, Mednicoff-Misra and Sitaraman corresponded with Mr. Despres about the meeting. They also wrote up a proposal describing what they wanted to do in the club. The first official meeting was mid October after figuring out all the kinks with Mr. Despres. Mednicoff-Misra and Sitaraman organize all the activities they want to do. Beginning the meeting with a writing prompt, students get time to write and share their thoughts. They began a book recently and had to read a certain section, so they began discussing that. Mr. Despres also participates in the meeting and plans on reading the books with them. The group aims to discuss a book per month. They meet almost every Monday starting at 3:15 in Mr. Despres’ room, 174. If he is out, they meet in the library. Mr. Despres also had a childhood steeped in reading. He was read to a lot growing up and his brain has always been “wired that way,” he said. He also believes reading to your child is very important and reads to his daughter Celia as much as he can. Mr. Despres struggles with the idea of having a smartphone; not only are students pulled toward them, but he is beginning to rely on his phone, too. He thinks it is a “powerful, cool tool” but admitted his own child has told him to put down his phone and to pay attention to her. Any and all students who want to have what he called s “casual, enjoyable encounter with books and reading” are invited to the club, held in room 174 on Mondays.